Dili – The Anti-Corruption Commission (CAC) team that comprises of former Executive Secretary of CAC Alxandre Freitas, Director of Support and Cooperation Services Carlos Bento Mau Bere and Chief of Unit of Cooperation João do Rosario held a meeting with US Ambassador to Timor-Leste Her Excellency Ms. Kathleen Fizpatrick accompanied by Chief-Political, Economic and Consular Section Channa Cummings and Senior Anti-Corruption Counsel Peter J. Ainsworth from Department of Justice today (27/8) at CAC office Farol Dili. The meeting objective was to discuss about further assistance that Department of Justice through the United States Embassy in TL would be provided such as implementing capacity building programs and technical assistance to CAC. 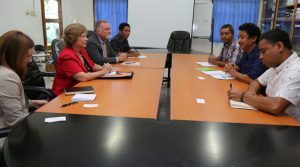 The United States Embassy in Timor-Leste has assisted CAC in facilitating training for anti-corruption specialists provided by the Homeland Security Investigations (ICE) and Federal Law Enforcement Training Center (FLETC) based in Singapore.